The liver performs many, many functions. Estimates range at over 500 different functions for the liver. The liver receives blood from the hepatic artery and hepatic portal vein. The blood in the hepatic portal vein is the "first stop" directly from the intestines, giving the liver the prime opportunity to detoxify substances. The liver synthesizes proteins such as albumin, fibrinogen, and prothrombin. Fibrinogen (Factor I) and prothrombin (Factor II) are clotting factors involved in clotting. The liver also makes Factors VII, IX, and X. Glucose is converted to glycogen in the liver. Glycogen is stored in the liver. The liver stores of fat soluble vitamins (A, D, E, K). Cholesterol is synthesized in the liver. Bile production occurs in the liver. Bilirubin is metabolized in the liver. The conversion of amino acids to carbohydrates through the process of deamination occurs in the liver. Iron is stored in the liver as ferritin. Copper is stored in the liver. Histology hint from Sarah Bellham: If ever asked where a process occurs, and you absolutely have no idea, make an educated guess of the liver. Histology slide of the liver. 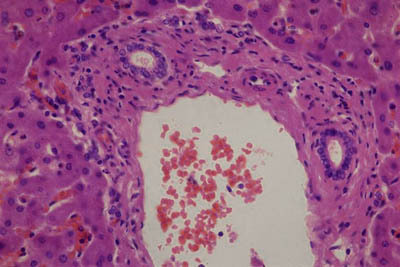 Histology image courtesy of Education Interactive Human Histology Photo CD. Hepatocytes are the liver cells. When looking at the histology it can be seen that the hepatocytes are arranged to form a liver lobule, which is the functional unit of the liver. The liver lobule is a hexagonal shaped structure. At the angles of the liver lobule are portal triads. The portal triad is composed of a branch of the hepatic artery, portal vein, and bile duct. In the middle of the liver lobule is a central vein. Hepatic sinusoids run between the hepatocytes. The space of Disse is in the liver. The space of Disse is also called the perisinusoidal space. It is the space between the liver sinusoids and the hepatocytes. The space of Mall is also in the liver. The space of Mall is located at the portal canal and is the region between the connective tissue and the liver parenchymal cells. It is the site where lymph is formed within the liver. Macrophages are mononuclear phagocytes. Many tissues have resident (fixed) macrophages. Fixed macrophages are given a unique name, depending on the tissue that they are located in. Kupffer cells are the hepatic macrophages. 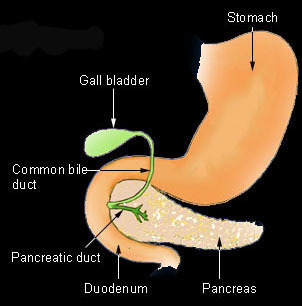 Once bile is produced by the liver, it is stored in the gallbladder. When looking at the histology it can be seen that tThe gallbladder is comprised of three layers: mucosa, muscularis, and adventita or serosa. Serosa is found on the free surface of the gallbladder. The mucosa is simple columnar epithelium and lamina propria. There is no muscularis in the mucosa of the gallbladder. The mucosa of the gallbladder is made of simple columnar epithelium. Histology hint from Sarah Bellham: The simple columnar epithelium of the gallbladder is very tall! Rokitansky-Aschoff sinuses are divertiuclae of the mucosa of the gallbladder. The small bile ducts which connec between the cystic duct and liver are the ducts of Luschka .